Sally moves to Dunballan to be with David. She cares for the people there who are comatose, slowly dying. Quiet Places starts off at the ending, and then you get filled in on what happened in Dunballan. Since moving to Dunballan, David starts to change. Sally senses things are not quite right, so she goes digging for answers. She discovers the curse of David’s family. The past is told through old journal entries. Jasper Bark takes us deeper and deeper into the past looking for answers to what happened in Dunballan. I was hooked from the first page. The initial event was cool because it catches your interest, and then you want or have to know what happened. Jasper Bark makes you think about his stories long after you read them, and Quiet Places is no exception. I’m really digging the mythos in this book. I will also read the other two books in this mythos series. 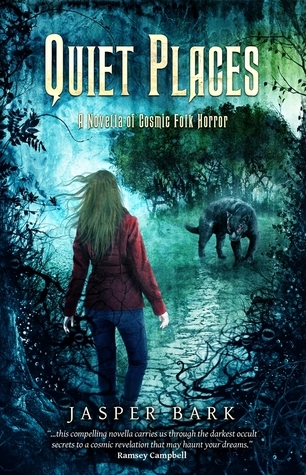 Quiet Places touches on several horror tropes. I like the way the story is told and I think you will too. I was fully invested in Sally. She is very relatable. The story unfolds smoothly and it kept me up late reading by lamplight.